Awhile ago, I upgraded my Golden Tee Classic game by adding all boardsets from the entire GT classic series and a 6 in 1 JAMMA switcher with nomote mod. As you may recall, I stated my reasons for doing so. Yes, the Fore! series is great, but I hate messing around with giant cabinets, giant monitors and hard drives. But once again, a deal came my way and I simply couldn't pass it up. What you are looking at is my latest Craigslist find. Yes, it's a Golden Tee Fore! Complete. If you aren't familiar with it, basically this has every course in the Fore! series, 29 courses in all. Even with having 6 boards in my GT Classic, I still had less courses that what this game has on a single board. But there's something different about this one, isn't there? Yes, this one is a bit smaller than a standard GT cabinet. Is it a conversion? Well, no. Actually this is the home model. Chicago Gaming Company had a contract with Incredible Technologies to build these smaller games for the home consumer. So yes, it's a smaller cabinet, but it shares the same hardware as it's bigger, coin operated brother. This particular game is in like new condition, seeing as how it never got abused in a commercial setting. So it's smaller, lighter and in showroom condition. It's got to be expensive right? Well the seller listed it for an insanely low $300. Oh yes, you better believe I called and claimed it immediately. The seller was a class act all the way I must say. This game was listed on a Tuesday evening and was about 90 miles from home. On top of that, my job keeps me extremely busy in the month of December. There was just no way an immediate pickup was going to happen. So I asked the seller if he would be willing to hold it for just a day. At the very least I could make the journey the next afternoon after work. The seller agreed. Then I remembered another friend in the hobby, and he wasn't too far from the seller. I had plans to be in town that weekend to visit relatives on Christmas day, but my friend was still willing to pick this up for me and allow me to pick it up from him on Christmas day. Tom, many thanks bud! All the while I feared the seller would get a ton of calls and jack the price up, as many on Craigslist do. While I know for a fact he got tons of interest, he kept his word and kept me first in line. Now another dilemma may have awaited me. We got home late in the evening and the weather forecast had called for rain starting in the overnight hours. There was no waiting for morning, I had to get this game inside immediately. On top of that, Alli was unable to assist me due to a knee injury she recently sustained, so I was on my own. While this game is smaller that a standard GT, it's still a bit bigger than many of my games. 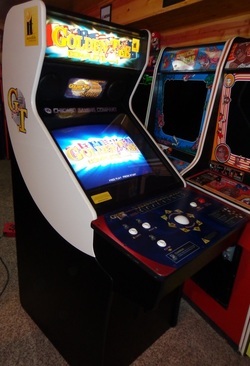 Even the GT classic this will be replacing has a 19" monitor, while this one has a 24" tube, which you would think would just make this game a beast in comparison. Another pleasant surprise awaited me. This game was unbelievably easy to move. While still wide and deep, it's height coupled with casters on the back made the whole operation of getting it unloaded & inside quite easy, and brief too. In less than five minutes I was playing. This game needed nothing, not even a wipe down. However it does have a hard drive that I will soon replace with a CF drive. I also added a lamp to the coin door. The game has no mechs, but it does have a reject button, I had to light it up for extra flare. What a great Christmas score! See you in 2016. Fore! 9/15 - Hang-On croaked, replaced it with a new "croaker"
Hang-On in the lineup. Well, after a couple years of ownership with my Hang-On I learned I was pretty much half-right, if that makes sense. Pole Position's headaches stem from poor board design with irreplaceable custom parts, problematic power supplies (of which there are not one, but 2 in a single game), and many were also cursed with a junk heap of a monitor. Well, in the case of Hang-On, they too can be a pain to keep running, but mainly due to the enormous amount of 1985 technology needed to operate. Hang-On has two big main boards and two smaller sound boards. That's 4 boards in total, each crammed with tons of parts, circuits, IC's and sockets. And this game requires every bit of it to run without any hiccups. If one leg of one socket goes bad, the game can't run properly, many times the game quits working altogether. As much as I enjoyed fixing & playing my Hang-On, this was an ongoing problem. It broke down again a few months ago and no matter what I tried this time, I was unable to resurrect. This was the last straw for me, especially since I have other driving games to enjoy, both of which have proven reliability and more appeal to guests. I decided it was time to let it go. It came close to a part-out, but in the end it ended up in the hands of another collector who doesn't live too far from me, and he has already made more progress with it that I did, so I'm glad he got it. Now I had to find another game to fill the void left behind. It actually started with another Sega driver called "Super Monaco GP". I had received it in trade for a couple of extra monitor's I had. It was working, but was very rough and needed some serious help. I put some new parts in it and cleaned & rebuilt the game as best I could. The more I played it, the more I really enjoyed it, so much so that I planned to keep it. Shortly afterwards, I got in touch with a local fellow who had some classic games. He got my number from the guy who sold me Gyruss. Isn't it great how a game pickup can start a chain reaction like that? Anyway he had some games he wanted repaired and some he wanted to sell. One game that caught my eye was a Frogger in pretty nice condition. I could tell it would need the usual cleanup & adjustments, but it wasn't going to take much at all to raise it up to my standards. While I did notice it didn't have the side art (like many Froggers that Sega/Gremlin released), the artwork the game did have looked to be in great shape. This one was one of his keepers, but I decided I wanted it and asked if he would be interested in a trade. I would put up my recently acquired Super Monaco GP including delivery & setup in exchange for his Frogger. He accepted, and I am once again bringing home another classic. As mentioned, I did need to do some cleanup & tweaking (mainly to the monitor) which took a mere 30 minutes. Another half hour or so was spent replacing a broken marquee light. Even though I have the game sandwiched in with other games and many Frogger's lack side art, reproductions are available and I like my games to be as complete as possible. So I called ArcadeShop and ordered new side art to install. I also ordered the High Score Save & Freeplay kit which I also installed. This kit is very similar to the Nintendo kits which I have also reviewed in the past (click here for that video) and always praised. In fact I only have one complaint, there is no option to have George Costanza's glorious high score programmed into the kit (ha, I sure hope Braze is reading this). Oh well, I guess that's more motivation to go for the high score myself. The other bonus is that the game looks great next to my two Centuri games. It's now in "wood grain row". Click image to visit GT2K page. A few years ago I acquired a Golden Tee '99 for a good price. Shortly after I had added a Golden Tee 2K board as well, so I could play both games in the same cabinet. Now fast forward to today. The Fore! 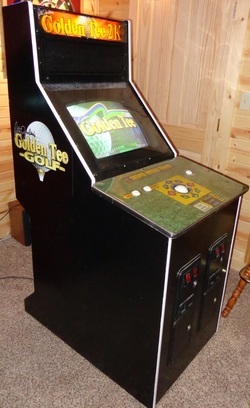 series continues to go down in price in our marketplace, and most collectors have been moving on "Golden Tee Fore! Complete". This was the last release of the Fore! series and it features all courses from the 5 years it was in service. I had almost jumped at one in fact, but I had just missed out on it, which was for the best for me anyway. As nice as the Fore! series is, I had grown fond of my classic series GT in it's converted Gauntlet cabinet. I just don't like dealing with large, higher-resolution monitors. 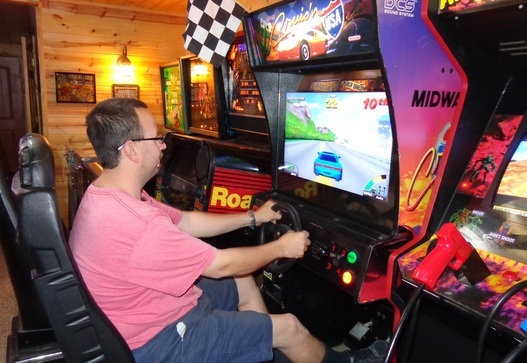 In fact, before our recent move I had sold most every game that didn't have a 19" or smaller screen, with the exception of Cruis'n USA which has an LED TV installed. With the Fore! series becoming more & more affordable, Classic series boards can be easily found for even less. I recently amassed a collection of all the Classic GT boards as well as World Class Bowling. I had also found a deal on a 6 in 1 JAMMA switcher with a new product called the Nomote installed. After some trial & error trying to get the trackball working with this setup, I now have a Multi Golden Tee classic setup. I now have access to more courses simply by holding down the start button. In celebration, the cabinet also got a facelift. Awhile ago I had custom side art printed & applied. More recently, I swapped out the yellowed '99 marquee with a NOS 2K marquee I had picked up along with a conversion kit at a local auction a short time ago. Last but not least, I replaced the T-Molding with white to give it that GT flare. Another game has been sold and replaced. Which one? Stay tuned. Even though I have a pretty full lineup in the gameroom, I am always on the lookout for bargains. I've learned a lot in regard to resurrecting dead classic games, and there's still lots of them out there. It's usually just a matter of someone getting around to listing one for sale. In this stage of my collecting, it's usually just about finding a bargain, fixing it up and flipping it for someone else to enjoy. But here's a real keeper. I found this beauty on Craigslist locally. Actually, the listing was for a Golden Axe that I had little interest in. Yeah, it worked, but it looked rough and was just too much for a game that wasn't really a golden age classic. The seller put Gyruss in as sort of a footnote, simply because the Golden Axe was working and the Gyruss was not. While there wasn't a photo of Gyruss in the listing, I could see part of the game in one of the photo's for Golden Axe, and from what I can tell it looked to be in good shape. Just dirty like usual. The seller had a more realistic asking price on the Gyruss as well, and after communications it wasn't long before we negotiated at $75, half the asking price. Nice! You better believe I hopped in the truck right away and made the short journey. I did end up negotiating and bought the Golden Axe also, but only for a heavily reduced price. I think the seller saw I was a knowledgeable buyer and just wanted it out of the way. Unfortunately the cabinet it was in was trashed, so it ended up being a partout. Anyone need a Golden Axe kit? Check out the Marketplace page. Anyway, back to Gyruss. While the game was in good shape, as mentioned, it was not working. It booted to a bunch of letters on the screen and locked up there. Part of the reason I negotiate these game's down so cheap is because I never know what I'm getting into until I get the game home and really tear into it. It could be an expensive board repair or something as simple as a fuse (yeah, we've all heard that one before). In this case, I got pretty lucky. The first thing I usually do after testing fuses with a multimeter is that I use said multimeter to test the power supply, especially when the game has a simple switching style supply like this one. Sure enough, I got a severely low reading at the -5v terminal. I pulled that old power supply out and just about died laughing when I noticed someone had etched the word "bad" into the metal casing. I guess whoever this was didn't feel like walking towards the nearest trash can or even grab a magic marker. Instead they likely grabbed the nearest screwdriver, branded it as defective and mounted it back inside the game. Well, as much as I enjoy working on these games, it's still so satisfying to simply grab a good supply from my stash and get the game working again in record time. Really, I spent more time cleaning this thing and making adjustments than I did fixing it. Well, ok, the monitor chassis needed caps too, but again, I just happened to have it's replacement sitting in the pile. And it needed a marquee lamp & starter. Big wow, right? I just had to make space and squeeze this one into my collection. Everything about this game is awesome. Fun gameplay, great graphics, awesome sound and stunning artwork. It really is the total package. Although this game was licensed to Centuri, everyone knows this is a Konami classic. So for the final touch, I just had to add a Konami badge to the coin door. All that's left to do now is warp my way to planet Earth. 4/19 - Finally, a Finished Gameroom! Well, it's finally time for a long overdue update. I finally have a finished gameroom! After finding our new dream home, it took months of moving from our previous home into two huge storage units, then moving again (once deals were closed) from storage to our new forever home, all in the middle of winter. But it really was worth it. Just like my Wife, Daughter & numerous animals deserve the new digs, these games deserve better than a lame, unfinished basement. Luckily for us, the previous homeowner had given the basement a complete renovation, including new carpet, new real wood paneling on all walls & ceiling and, most importantly, updated electrical with plenty of circuits to power all of my toys. I simply had to remove a couple of wall sconces and add one elsewhere to make room. Yes, I did have to sell a couple of high dollar pieces (such as Tron, Gorf & Elvira) to make this happen, but again, well worth it. I was even able to add a couple new pieces to the collection. Check out the new photo gallery below, along with a new narrated tour video. The ﻿My Games﻿ page also has the new photos & video, plus another video of a brief, unnarrated tour. 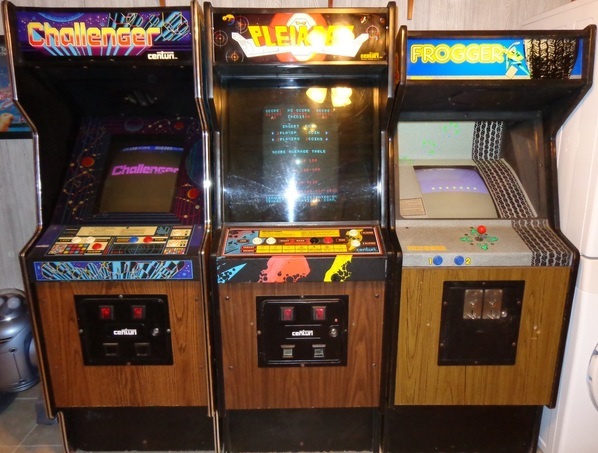 The Marketplace page has also been updated with lots of arcade parts added for sale or trade. Enjoy the updates. New game pages will be coming soon, I promise. Click here to visit 2014 Archives.